Quality and high control rubber, suitable for beginners and players that like to control the game. High control and insensitive to spin. 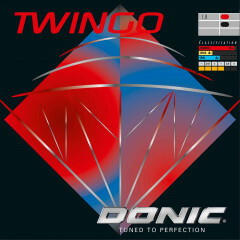 DONIC TWINGO - A lot of table tennis for little money! The right choice for ambitious hobby players and new­comers to match play. A grippy, long lasting top surface combined with a soft sponge, guarantee top rate feel. Donic Rubber Twingo is beeing added to cart.